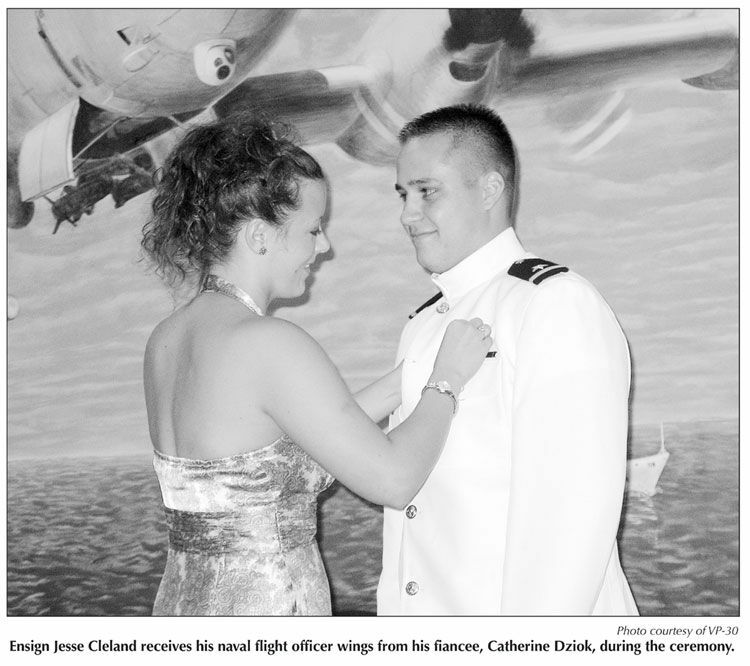 Photograph Caption: Ensign Jessee Cleland receives his naval flight officer wings from his fiancee, Catherine Dziok, during the ceremony. VP-30 began a new era in naval flight officer (NFO) training recently by conducting their first NFO winging ceremony. 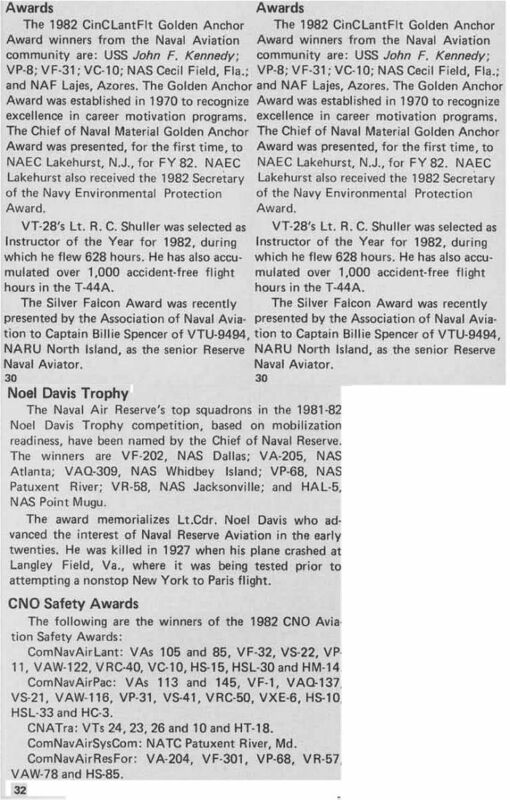 This ceremony was the result of the Chief of Naval Air Training's (CNATRA) trial initiative known as the Undergraduate Maritime Flight Officer (UMFO) Program. Through this initiative, CNATRA hopes to streamline the P-3 NFO training pipeline while providing the maritime patrol community a better product. During the ceremony, VP-30's Commanding Officer Capt. Tim Brewer awarded NFO wings to: Ensigns Jon Baccus, Jesse Cleland, Drew Mickleth wait and Justin Rogers. The event and reception drew family members and friends from around the country. For Rogers, a Jacksonville native and former aviation warfare systems operator at VP-45, this designation brings extra significance as he has exchanged his service in a support capacity, for a top leadership position within a P-3 tactical crew. The recipients have completed the undergraduate maritime flight officer syllabus, earning their wings. The four will now enroll in the CAT 1 fleet replacement squadron (FRS) syllabus. Their anticipated graduation date is scheduled for Feb. 9. Upon their graduation at VP-30, they will report to various operational patrol squadrons to begin their initial sea tour. 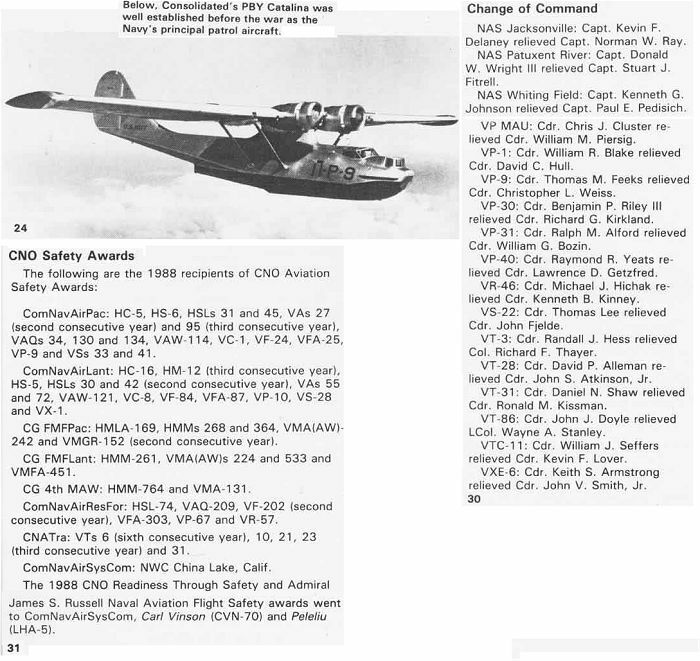 The NFO training pipeline begins with aviation preflight introduction (API) instruction in Pensacola, Fla. After completing API, all student NFOs report for primary training at VT-10 or VT-4, also at NAS Pensacola, Florida. In the traditional training track, multi-engine designated NFOs attend advanced navigation training at Randolph AFB in San Antonio, Texas. Upon completion of this course, they are awarded their wings of gold prior to transferring to VP-30 where they receive P-3 FRS training. 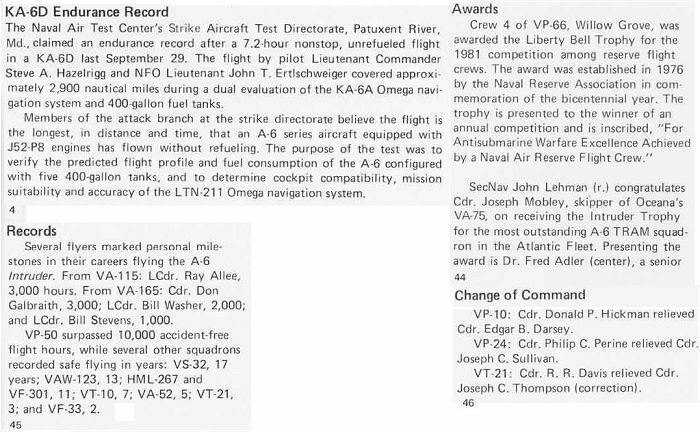 The four UMFOs reported directly to VP-30 following completion at VT-10 or VT-4. With the continued success of this experimental initiative, CNATRA may begin sending all maritime NFO's directly from primary flight training to VP-30, bypassing advanced training at Randolph AFB. 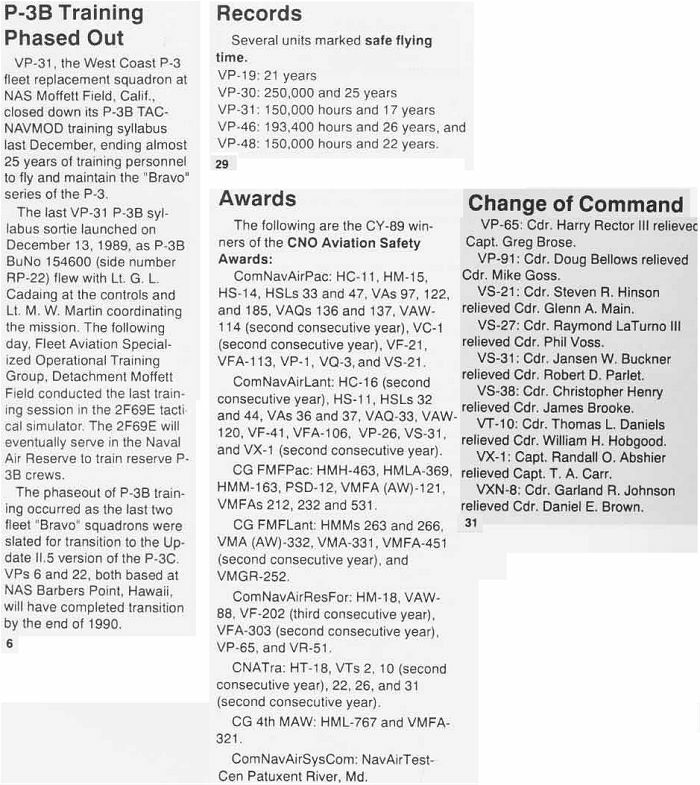 The primary and VP-30 courses would add additional events to accommodate the loss of advanced training. As a result, the process would reduce current redundancies in training, reduce the number of PCS moves, create a focus on P-3 specific NFO training, all while reducing the overall training time by 10 weeks. In 1960, Training Squadron TEN (VT-10) was established as a division of the Training Department of NAS Pensacola and was known as the Basic Naval Aviation Officers (BNAO) School. It was strictly a ground training operation until the school was assigned nine UC-45J "Navigators" and six T-2A "Buckeyes" in February 1962. The T-2As were soon replaced with nine T-1A "Sea Star" aircraft. 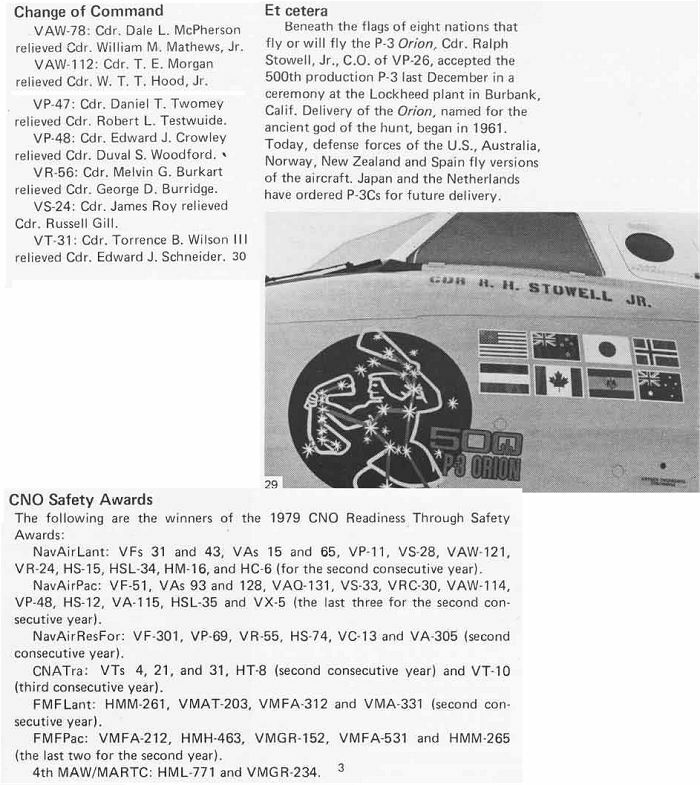 In 1965, Naval Aviation Observers were redesignated as Naval Flight Officers (NFOs); and in 1968, BNAO School was officially commissioned as VT-10. 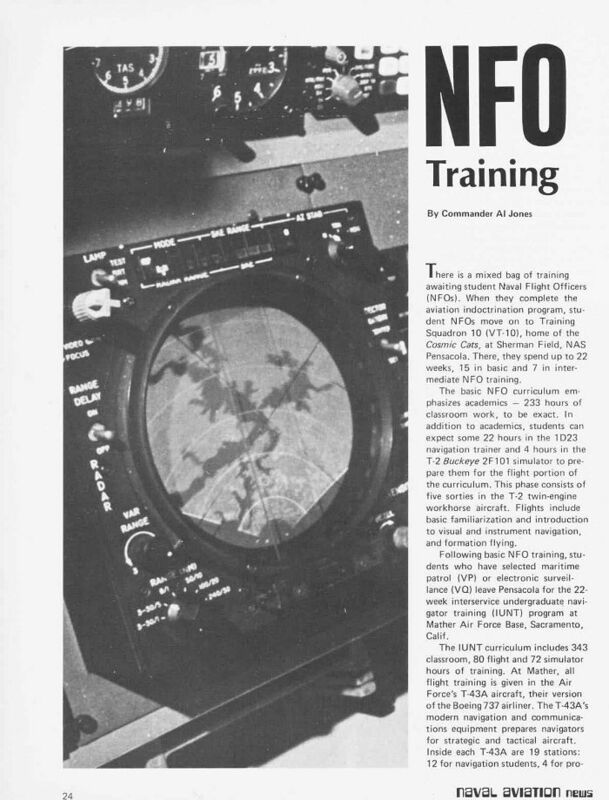 By November 1970, Training Squadron TEN had trained over 6,000 student NFOs. In 1971, Training Squadron TEN transitioned to the T-39D "Sabreliner" jet trainer and the TF-9J "Cougar" which was replaced two years later by the newer T-2C "Buckeye". The squadron doubled in size between 1972 and 1974 to accommodate an increased training requirement, maintaining 40 aircraft: ten T-39Ds and thirty T-2Cs. 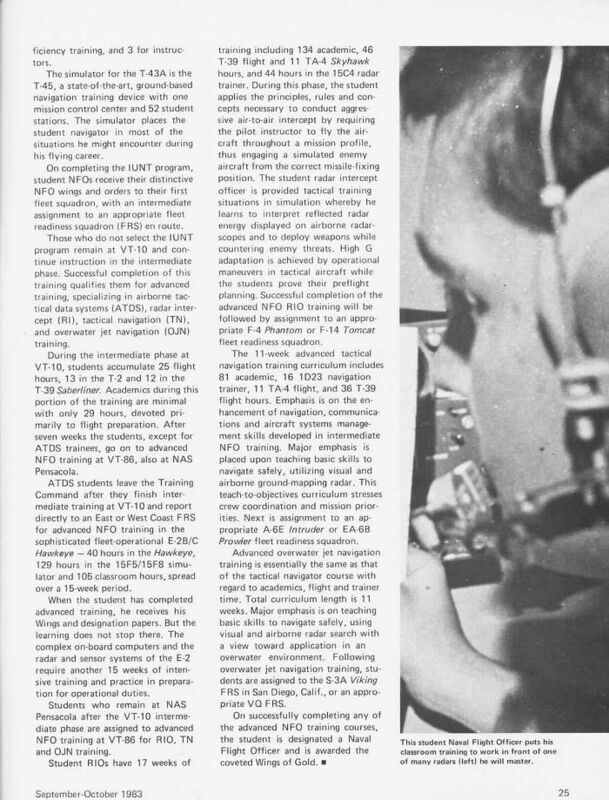 During the 1970s several flight ground trainers were introduced to the syllabus, including the ID23 NAV/comm trainer, the 2F90 instrument trainer, and the 2F101 flight simulator. In 1981, a reassignment of aircraft within NATRACOM replaced VT-10's T-2C aircraft with T-2Bs. The squadron revised its training in 1984 and acquired twenty T-34C "TurboMentors"; and the Cessna T-47As replaced the T-39Ds in 1985. During 1991, revolutionary changes were made to the NFO syllabus. To improve NFO air sense and situational awareness, forty additional flight hours were placed in the curriculum allowing instruction in basic piloting skills including aerobatics, takeoffs, and landings. The same year, the squadron replaced the T-47A with the T-39N "Sabreliner" which had upgraded avionics and radar. The T-2Bs and the air combat maneuvering syllabus were transferred to Training Squadron EIGHTY-SIX (VT-86). At the same time VT-10 acquired twenty additional T-34Cs and two new 2B37 instrument trainers for primary and intermediate training. 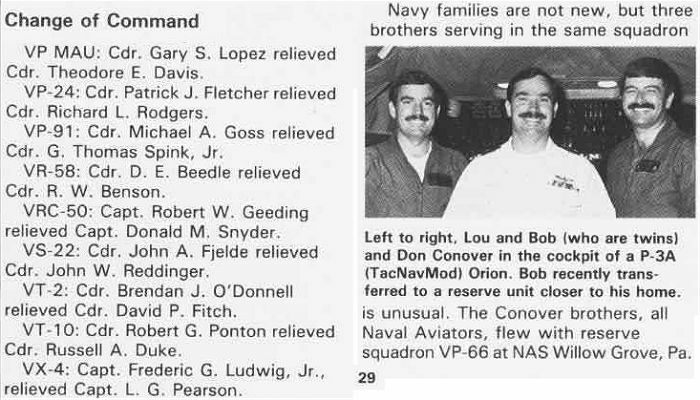 In 1994, the first U.S. Air Force instructors and student navigators (NAVs) reported to Training Squadron TEN under a joint memorandum of agreement between the services. The agreement included the 1996 transition from the T-39N to the Air Force T-1A "Jayhawk" as the training platform for the intermediate syllabus events. 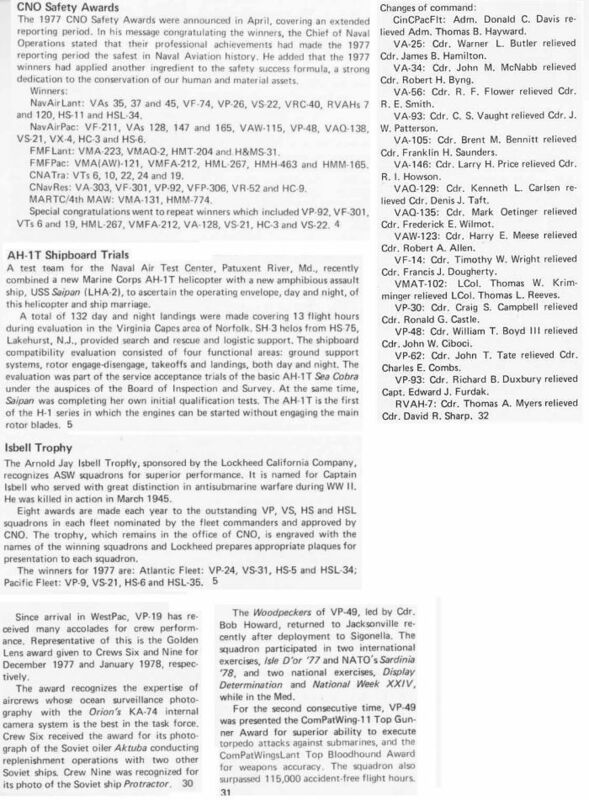 In April 1996, VT-10 split instructor and student assets to assist in the establishment of Training Squadron FOUR (VT-4) as a second NFO/NAV Primary/Intermediate Training Squadron. VT-10 has an 80 member Navy, Air Force and Marine Corps instructor staff which currently trains over 400 NFOs/NAVs and 50 foreign student navigators annually. 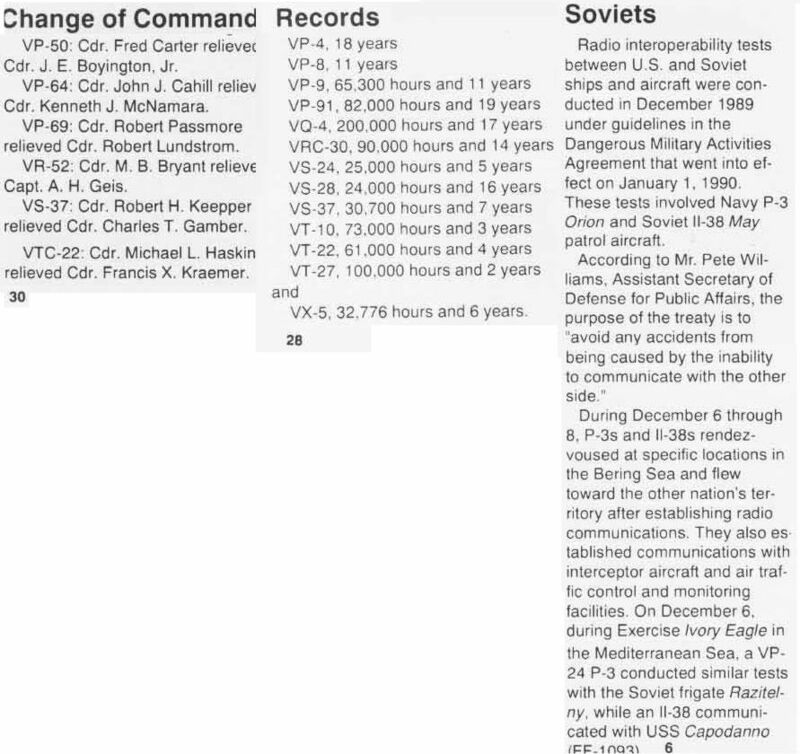 In 1997, command of VT-10 began alternating between the Navy and Air Force. 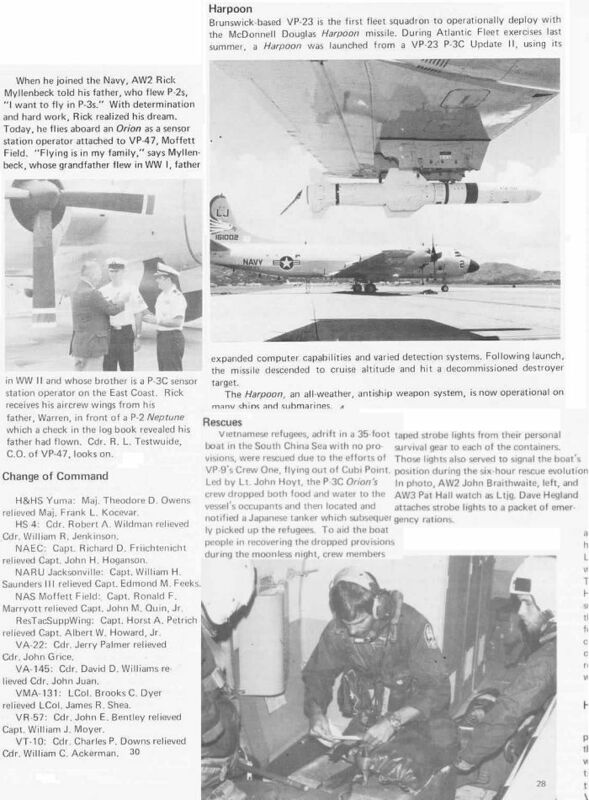 Upon graduation from the Primary or Intermediate phases at Training Squadron TEN, Navy students proceed to follow-on training at VT-86 (S-3B, ES-3A, EA-6B, F-14), Randolph AFB, TX (P-3C, EP-3, E-6A) or to VAW-120 in Norfolk, VA (E-2C). Marine Corps students receive additional training at VT-86 (F/A-18D, EA-6B). Air Force students selected for strike training (F-15E, B-1B, B-52) proceed to VT-86, Electronic Warfare Officers (MC-130, AC-130, RD-135, B-52) proceed to Corry Station, and Panel Navigators (C-130, KC-135) receive further training at Randolph AFB, TX. Training Squadron TEN has been awarded five Meritorious Unit Commendations and seven Chief of Naval Education and Training "Shore/Technical Training Excellence Awards", the most recent in 1997. "Wildcat" safety initiatives have earned the squadron thirteen Chief of Naval Operations Safety Awards. 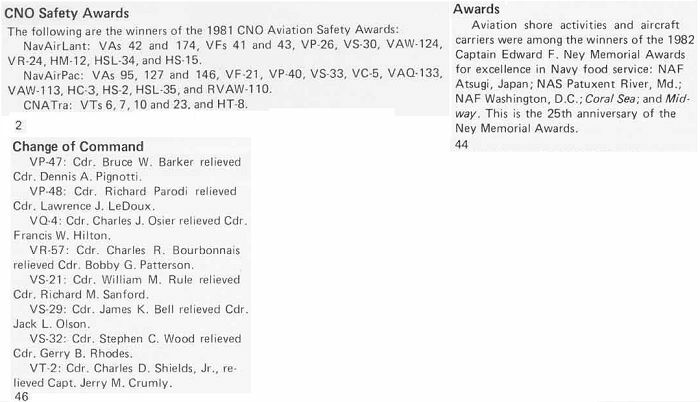 The squadron was awarded the Towers Award for safety in 1978. 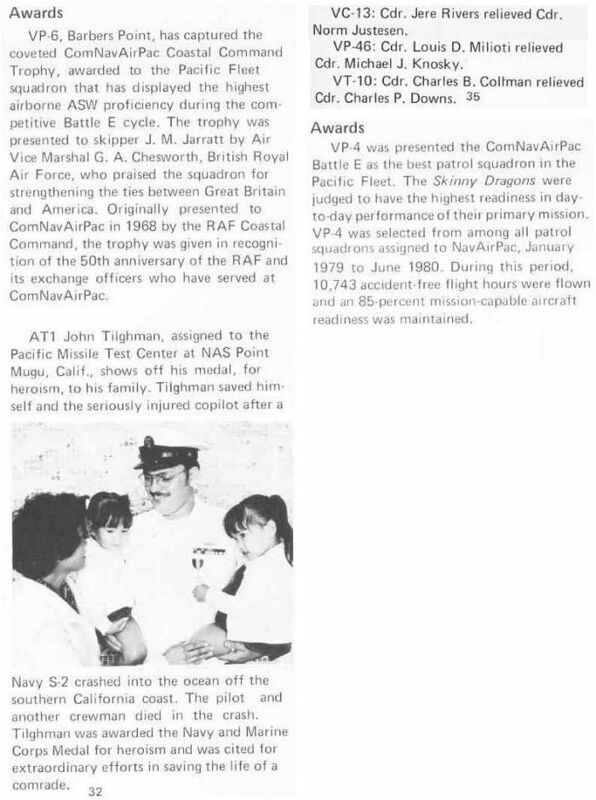 VT-10's extensive energy conservation efforts and improved efficiency enabled the squadron to receive the 1995 and 1996 Secretary of the Navy Energy Conservation Awards. VT-10 has aggressively met the challenges of a changing training environment and continues to proudly serve as the "NFOs Gateway to the Fleet."